The end of last week I went down to participate in the 71st Annual Texas Society of Architects State Convention. I always enjoy myself at these conventions but this time it was a little different. I was presenting on a panel for social media so I was there to work (not really). I don’t really have a hard time talking in front of a large group – meaning I don’t really suffer from any form of stage fright. But I haven’t ever stood up in front of this large a group (around 200) and presented a structured and timed presentation. Hopefully within the next few days, I will figure out how to animate my powerpoint presentation along with me talking and I will put it up on the site. While I am working that out, I thought I would show you one of the extra-curricular activities I did while I was in San Antonio – I went and visited the historic battle site ‘The Alamo’. The fortress known to history as “The Alamo” was originally built by the Spanish in the 18th Century. Named Mission San Antonio de Valero by Franciscan officials, the mission occupied this site from 1724 until it was closed in 1793. The mission compund encompassed modern Alamo Plaza. The church was never completed and lacked a roof at the time of the famous 1836 siege and battle. Today this building is recognized world-wide as the Shrine of Texas Liberty. 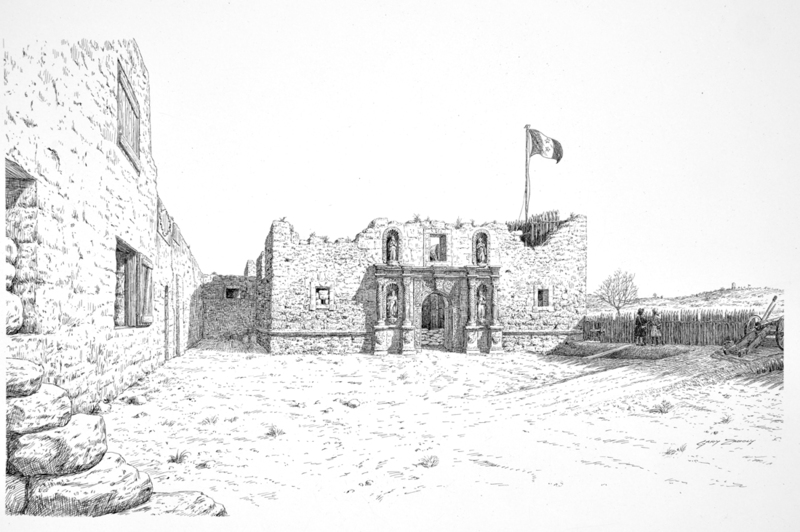 The structures shown in the illustration below are (left to right) the Long Barrack, the front of the church, and the Palisade Wall. I spent most of my time walking around the perimeter and enjoying the gardens – some of the trees on the interior are really old. This Live Oak – one of my favorite species of trees – was particularly impressive. I am besieged by a thousand or more of the Mexicans and Santa Ana. I have sustained a continual bombardment and cannonade for 24 hours and have not lost a man. The enemy has demanded a surrender at discretion, otherwise, the garrison are to be put to the sword. If the fort is taken – I have answered the demand with a cannon shot and our flag still waves proudly from the walls. I shall never surrender or retreat then, I call on you in the name of liberty, of patriotism and everything dear to the American character to come to our aid, with all dispatch. The enemy is receiving reinforcements daily and will no doubt increase to three or four thousand in four or five days. If this call is neglected, I am determined to sustain myself as long as possible & will die like a soldier who never forgets what is due to his own honor & that of his country – Victory or Death! It is not the Alamo building itself that is inspiring, but rather what it represents. In 1836 between Feb 23rd and March 6th, The Battle of the Alamo was a pivotal event in the Texas Revolution. Facing certain death, a few hundred Texican defenders faced approximately 1,500 Mexican Troops and following a 13-day siege, President General Antonio López de Santa Anna launched an assault on the Alamo Mission where all but two of the Texian defenders were killed. Santa Anna’s perceived cruelty during the battle inspired many Texians to join the Texian Army and ultimately the Texians defeated the Mexican Army at the Battle of San Jacinto, on April 21, 1836, ending the revolution. As I stood there reading about this battle where the few were slaughtered by the many, it made me think of myself standing in the conference room the next day. Was I one of the few and were we going to get slaughtered? In hindsight, maybe visiting the Alamo wasn’t such a good idea after all. Life of an Architect living the Life of Riley? Perspective - do you have it? Is Social Media making me crazy?